Discussion in 'Brights, Gizmo's & toys' started by Tony, Mar 15, 2019. I've got a couple of products in for review, the HS2 headlamp and the S1R Baton 2, both look nice and seem to perform well but I don't know a lot about the manufacturer or their other products. If any of you have experience with their products I'd like your thoughts and opinions. cheers! Never owned one but they get a decent rep. Chinese company, quality is pretty good. They seem to keep up with the technology for LEDs, USB charging, batteries etc. I replaced my headtorch with an armytek recently, never went for the olight H1R as there was not much to differentiate from the armytek but it was definitely a contender. be interesting to see how they work out, the baton gets a good rep. 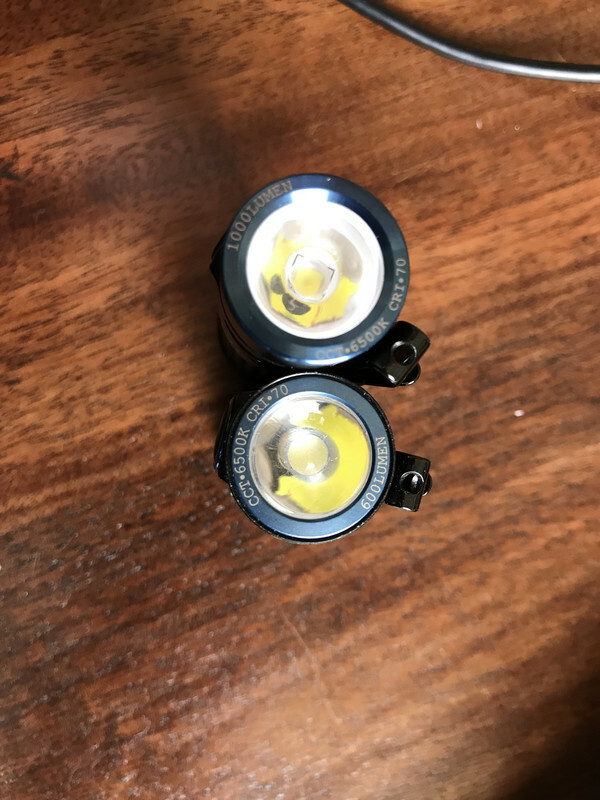 I reckon Olight are right on top of the game at the moment. Their products are innovative and user friendly, not too complicated and very nicely made. I have the SR1 Baton 2, and the S1 Mini. I’ll get some pics and thoughts up here over the weekend sometime. I have a couple of Olights. I bought a rather silly X7R Marauder when it was on sale and that's great, but it's huge and heavy and can only be recharged, you can't change the batteries like you can in the non-R model. I love it, build quality is very good, USB-C charge socket, the power button lights up if the torch moves which is handy in the pitch black. I volunteer for my local RAYNET group and am sometimes in a field in the middle of nowhere until late at night, so that's my use case for such a big torch. It's bordering on a searchlight, and you could use it as a hand warmer. It came with a free S2A Baton. That's a useful torch, takes a double AA, but I find the button isn't obvious and it takes a second to find it. 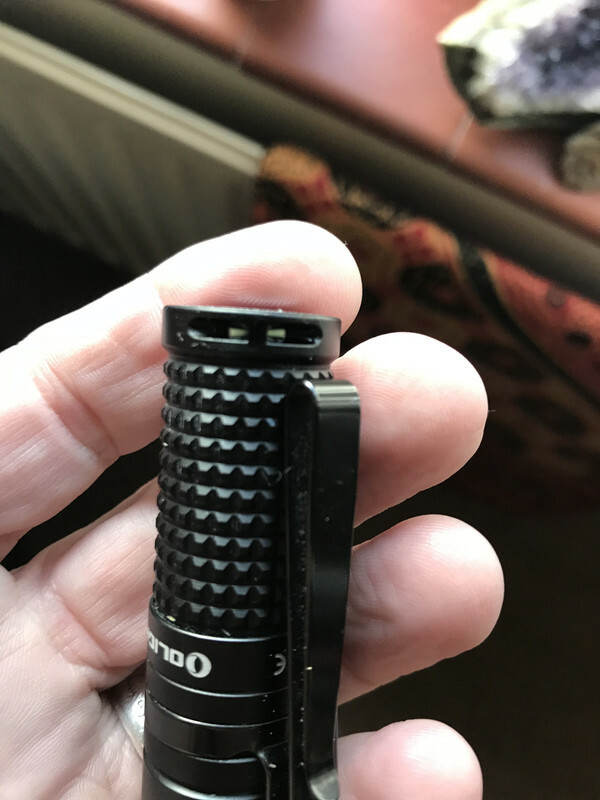 If it had the power button on the base (like my older Nitecore SRT5 and SRT6) it'd be perfect for a pocket torch. I like the convenience of AA batteries, even if they're not as powerful as a CR123 or 18650. I do need a better head torch, I have a Petzl Pixa 1 which is fine for close up work but isn't designed for say, hiking at night. When I decide to get a brighter one I'll get an Olight. The UK reseller is based in Ireland and the service is very good in my experience so far. The Olight that I have is superb quality. Right down to the box it came in! Apple level design and care went into the box alone. Found this picture on: http://budgetlightforum.com/node/43238. This is not the polished version that I have, but otherwise the same. So far, I have considered it too nice to use, it is still in its box! Pretty good review. Yvelines, north-west of Paris, France. I had an SR1 Baton for a while. Wonderful little torch, I used to keep it clipped into the cuff of my Barbour when cycling to and from the railway station for the commute to work and back. But then it failed after I think about four months of use, wouldn't charge any more. Tried a different battery in it: same problem. So at a guess, it was the charging circuit. Back to Amy Zone and refunded. I'm seriously thinking of getting another one, though. It really was that good. 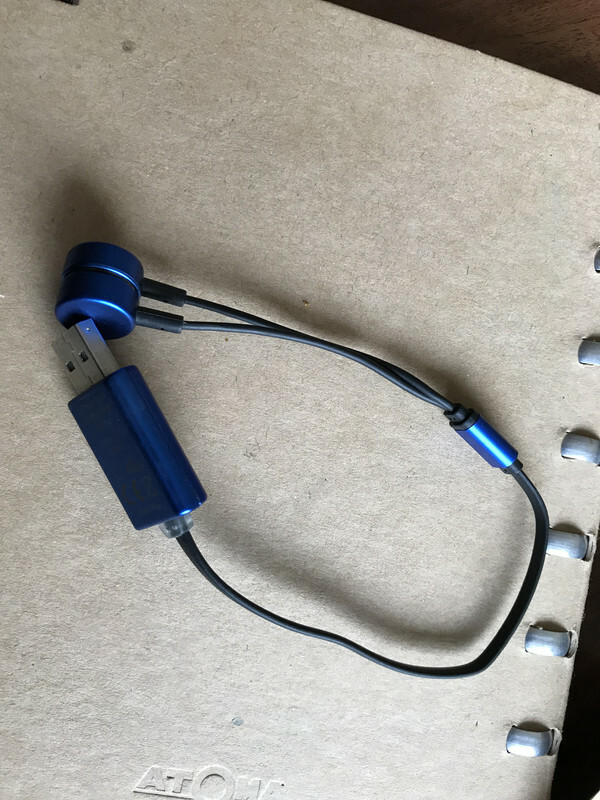 Some pics and comparisons of the S1 Mini and SR1 Baton 2. The “R” simply means rechargeable, in this case with a magnetic charger that attaches to the base of the torch. Both have a kind of double clip that allows for different carry, like hat brim or pocket. I don’t really like the clips, bezel down pocket carry isn’t as easy as the bezel up due to the design. I’ve had one ping off as I took off a layer of clothing, but this is a clip problem generally I suppose, I’ve had this happen with knives too. I’ve also accidentally activated the light by reaching in my pocket for change. On both torches is a lockout activated by holding the button from off to on, to off in one long press, so I tend to use the lockout mode now. Sizewise, the Mini really is very small indeed, not much bigger than the CR123 that powers it. I’ll show you that bit of cleverness in a moment. On the buttons are LEDs that show green, yellow, red as battery level indicators. 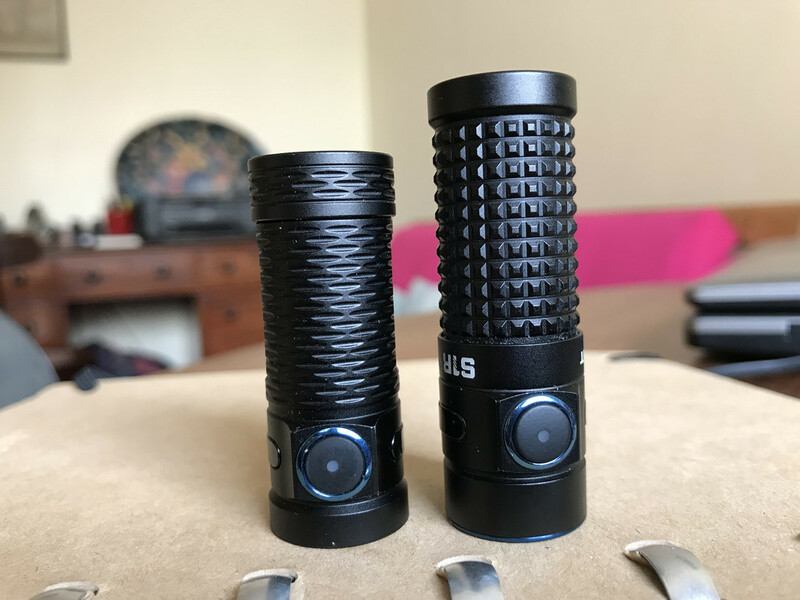 So, both very small torches with very high output. How do they do it? Key to the size is the type of optic used. 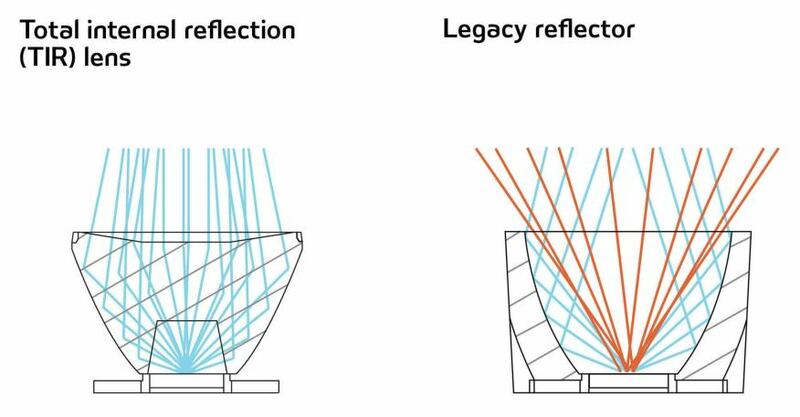 We’re all used to seeing a mirror coated reflector, deep for beam throw, or shallow for a wider flood beam. These torches use a TIR which is a Total Internal Reflector, it maximises light output while remaining very shallow. Most standard reflectors scatter and lose some of the light emitted. The TIR uses all of it, increasing output by not losing light. This is what the reflector end looks like, the LEDs are very close to the lens. Now, I hope I haven’t overdone the science of it at all, but what we get is a silly small torch that punches out a lot of light because the lens captures and reflects more of it. This is brilliant on small torches and gives a wide bright beam. 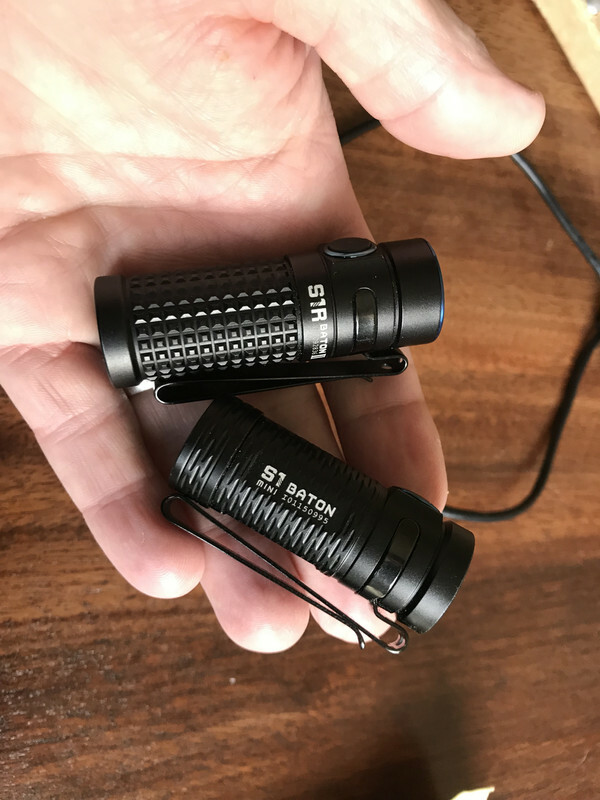 You’ll see from the bezels that these two are rated at 600 and 1000 lumen output, Olight tend to be accurate and not overstate output as many manufacturers do. The S1Mini will take any CR123 battery, but will only run its turbo mode of 600 lumens using the Olight battery provided. This is no big deal, you’ll hardly notice the difference anyway. The battery it comes with has a micro USB for charging making it convenient for car use etc. It also has a magnetic tailcap for fixing to stuff. Here it is plugged in. 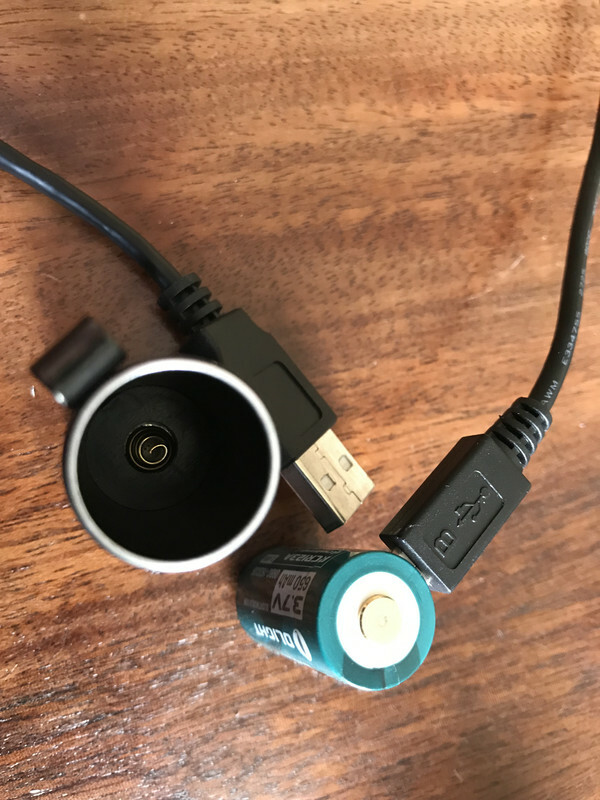 This also takes any CR123 battery, but it won’t charge from the charger even if it’s a rechargeable, Olight battery only. My preference of the two has to be the S1R. It’s just so convenient to bung it on the charger, I swear if I chuck the charger at the end of the torch the magnets just click it on, it’s briliant. The knurling is really lumpy and grippy, good for gloved hands. And it really does put out some light. The Mini is lovely, very tiny and cute, and a perfect pocket edc. I can’t knock it at all, I drop it in my pocket all the time, it’s small enough not to get in the way of a set of keys if you needed a keyring torch. 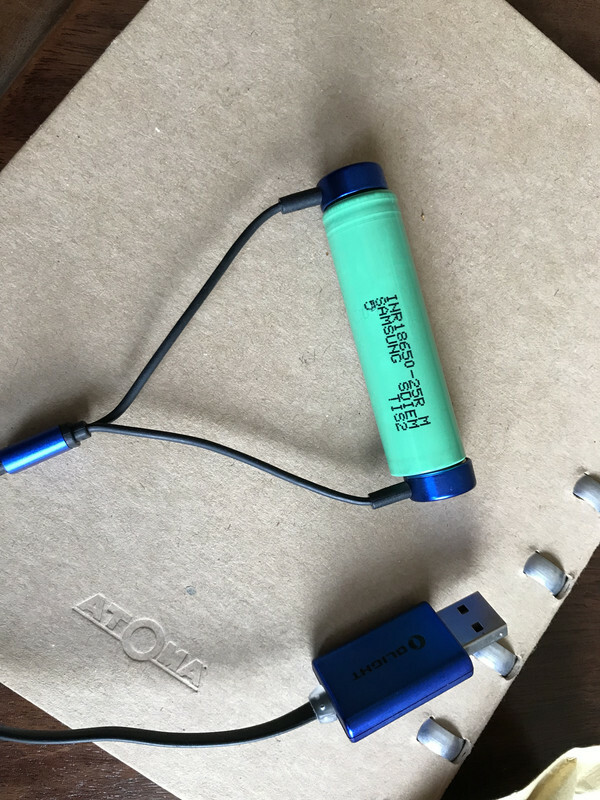 One more product from Olight that is worth a look is this charger. It’ll charge anything from the 1.2v AA and AAA Eneloop type rechargeable, right up to the 3.7v Li-ion batteries with no problem. 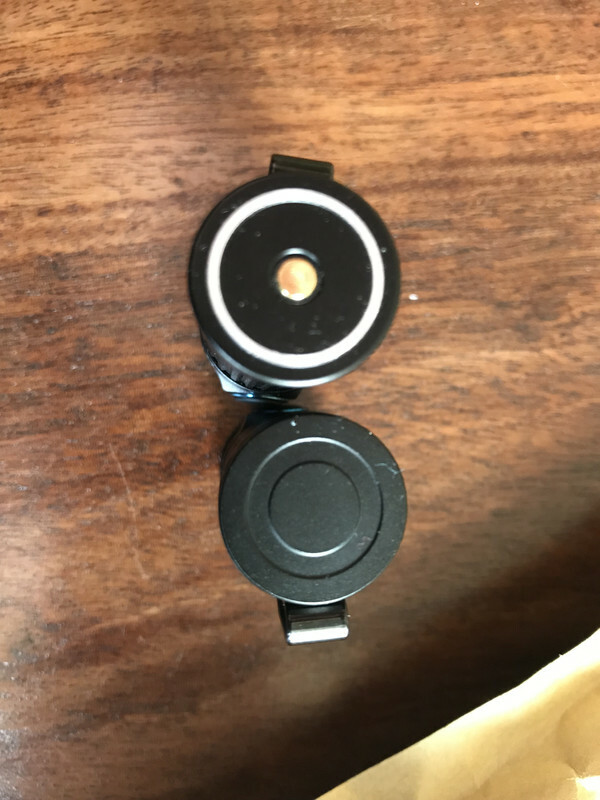 Double magnetic contacts just clip on, doesn’t matter which way round, and off it goes. Shows red light while charging, green when done. It’s very simple. 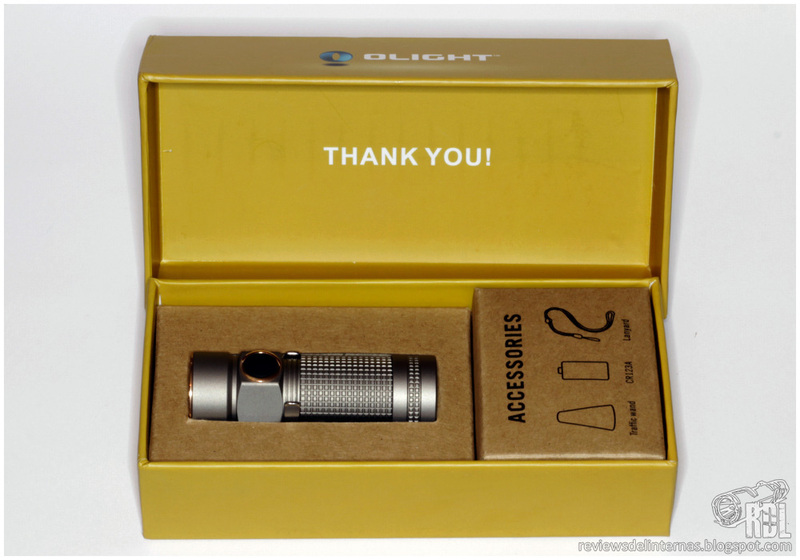 I like Olight at the moment, they’re thinking about practicality and outside the box. I’ve had a couple of their bigger torches and not really been astounded. Mind you, they were old stock by the time I picked them up cheap, but these pocket lights, especially the R range are impressive. I see a sale coming up on the 22nd, reducing the price of the S1R Baton 2 to £38.49. That’s a good price I reckon, if I didn’t have one I’d be all over it. I want that grey Titanium Winter version, coolest torch ever. Mine arrived this afternoon thanks to @Nice65 and his posts here and elsewhere. I really can't believe the amount of light it throws out for such a tiny package and the intuitive interface makes it simple for even an ageing non-Jamie like me to operate. I'd have posted sooner, but wondering how bright 1,000 lumens could be and finding out from six inches made typing a wee bit difficult without a braille keyboard. Chainsaw and Nice65 like this. Just to confirm what others have said, great products , excellent build quality. I have an SR52 search light. I like to sometimes modify torches and took it apart to change the LED. The heat sink is a massive lump of solid copper, very well over engineered. In fact I had trouble soldering the new LED back as the copper heatsink quickly drew all the heat away, I had to break out the big soldering iron ! Nice65 and beachlover like this. Need a car glove box or by-the-door torch? 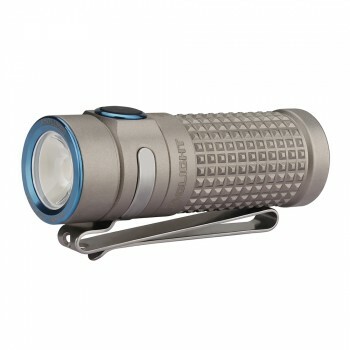 Just had an email from Olight with a flash sale on the 2xCR123A and 18650 powered M2T Warrior. Price is 50% off at £30.48, down from £60.95. They’ve been generous and stayed over the free shipping threshold. For anyone that doesn’t do 18650 torches, I’d recommend this battery size, it’s pretty much charge and forget in terms of capacity. 15th April only. A small mod to my S1R. 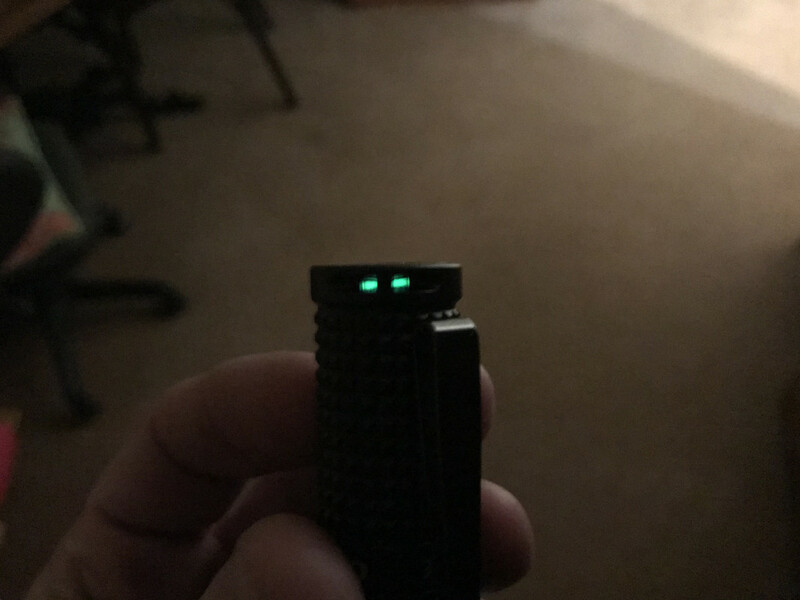 Most of my torches have a tritium vial or locator. I mean, what good is a torch in the dark if you can’t find the torch? Fed up with knocking this thing down the back of the bedside table in the night, I thought I’d glue a 6mm tritium vial in the lanyard hole.